In the 11thand 12thcenturies small “husun”, tiny castles and enclosures with towers, came to dominate the border region between western and eastern Andalusia. Since 2003, a project has worked to study and preserve these towers. Map of Segura Torres © Santiago Queseda. Between Sevilla, Valencia and Granada run a system of major roads, some of which dates back to antiquity. In the high Middle Ages, during the final years of the Islamic period, the border region between the major Taifas and the encroaching Christian Kingdom of Castille came to be dominated by a complex system of large castles, small castles, “husun”, as well as villages with towers. As the roads would run along the rivers, the fortifications would be visible from the road, yet towering above, ready to provide the first line of defence as well as a base for extraction of customs payable to the lord residing in the castle higher up. Such towers were built with a specific technology, as rammed-earth constructions. It has long been recognised that these towers mark out a distinct cultural landscape, providing information about the territorial and agricultural organisation. The watchtowers were peculiar for their location on top of hills but without further defensive structures. Nevertheless, they controlled the access to the castle higher up. Construction of the towers was characterised by the use of tapia (tabia), a technology featuring stamped earth and lime. Described by Pliny in his 35thbook of natural history, the technology was not exclusively Islamic. Rather, it appears to have been in general uses since antiquity. The smaller castles, however, appears to have been built with another type of technology, using at the bottom a foundation of perfectly rounded stones, laid with mortar. On top of this, walls would be constructed by using a mixture of gravel, sand, and lime. Since 2003 a major project has been underway to carry out a systematic study and analysis based on archaeological surveys and written sources. The aim has been to get a better sense of how the landscape was organised in the period after the year 1031, when the Caliphate in Córdoba collapsed. So far, the project has provided photo-documentation and topographic surveys of all the remaining (ruins) of towers, dated (C14) to the period between 1018 and 1155, which means they were probably constructed under the auspices of the Taifa Moorish Kingdom of Saqura and carried into the Almohad period. 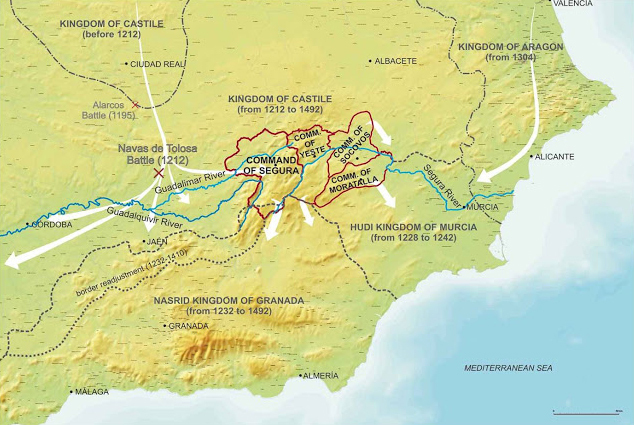 After the battle of Navas de Tolosa in 1212, the region was given by the King of Castille to the military Order of Santiago – together with its rich and fertile landscape filled with forests, irrigated land, salt mines, vineyards, rivers, mills, fisheries, meadows, pastures, and tolls. A dominant part of this landscape, however, continued to be the “husun”, which were used by the local population as community refuges. Torres Santa Catalina at Orcera © Santiago Queseda. The project has aimed at providing information of how to restore and preserve this unique landscape. Part of the intent, however, has also been to provide people access to the landscape by organising hiking and cycling routes. In the future dossiers, guides and itineraries will be disseminated on the dedicated website, Santiago Queseda. The Group has also produced an exhibition, currently on show in Seville. The detached farmstead towers from 12thCentury Sierra de Segura (Jaén, Spain): contributions to the territorial settlement of the al-Andalus period. In: Heritage 2018. Proceedings of the 6thInternational Conference on Heritage and Sustainable Development. Ed. by Gogéria Amêda et al. Blog post on Nosotros y ella, la arquitectura Santiago Quesada. The post Islamic Towers from the 12th century in Sierra de Segura near Jaen in Spain appeared first on Medieval Histories.